Between all the painting (which is now thankfully done), re-covering the kitchen chairs, and general weekend havoc, I paid a trip to Dr. W. at Oak Forest Animal Clinic. It was time for my yearly vaccinations and a physical and dental check-up. Jamie, Mom and I arrived a little bit early. We were shown into the exam room and then it was time to wait for the Vet, just like you humans wait for your doctors. I was a little nervous but excited. I didn’t know what to expect. The door shut and suddenly, I heard a very deep, very loud, WOOF from behind the closed door. The WOOF!ing kept up. 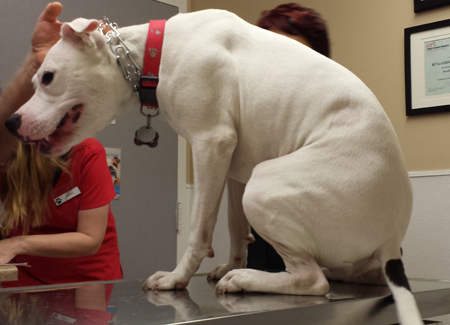 I heard the doctor talking to this very vocal patient. I know the dog was big. I just don’t know how big! Anyway, when I realized I couldn’t open the door and take a peek, I flopped down on the floor to wait. Soon the barker left and a short time later, a very nice, good-smelling young lady came into the room and helped Mom lift me onto the table. I was very affectionate and gave lots of kisses. Within a couple of minutes Dr. Craig Welbourne came into the room and the exam started. He exclaimed over my good muscles and teeth. He tried to take my heart beat with the silver necklace, but I thought he wanted to wrestle and so I played around a bit. Dr. W. looked at the dent in my side and said it was OK.
Dr. W. gave me two injections, for Rabies and Distemper, and then came the surprise. I needed a blood test! I had never had one. Dr. W. wrapped a piece of a rubbery band around my foreleg and stuck the needle in. Jamie said, “You should have seen the look on your face!” It hurt a bit, and I realized in my Pitbull wisdom that it would behoove me to sit very, very, still. So I did. Mom was shocked! She thought I would fight the good Doctor, but I did not. I got a lot of tasty treats for behaving, and Mom got a little bottle to put a poop sample in the next time I went outside. Lucky Mom! I was ready to go home. Overall, I had a great visit with the best Vet in the world! Mom got all the test results back the next day and I am fine from teeth to tail. 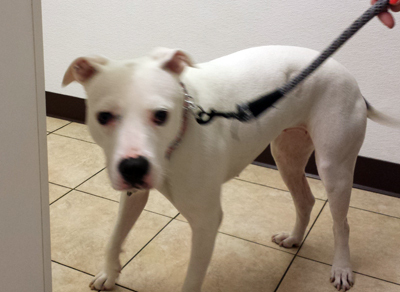 This entry was posted in Uncategorized and tagged dogs, Dr. Craig Welbourne, good checkup, Oak Forest Animal Clinic, Pitbull, vet, veterinarian visit on April 28, 2014 by maggie0019. Mom gave me back Chair Privileges. OMG I am so….relaxed and sleepy right now. This entry was posted in Uncategorized and tagged chair, dogs, family, Pitbull, relaxed, sleeping on furniture on February 18, 2014 by maggie0019. What do you mean, I’m on the Naughty List? 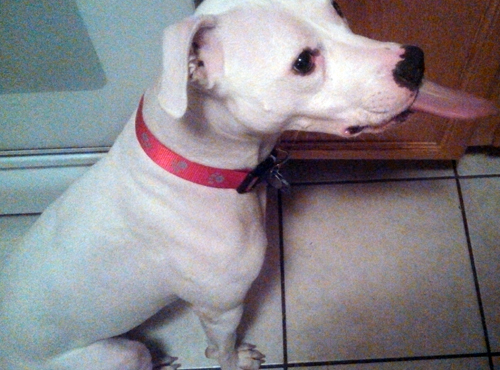 This entry was posted in Uncategorized and tagged naughty list, Pitbull, tongue on December 24, 2013 by maggie0019. Merry Pit-mas and Happy Howlidays to all my friends! 1. Overbreeding by unscrupulous puppy mills for money. 4. Dogs kicked to the curb for not winning in dogfights. 5. The economy (people cannot afford their pets, have had to downsize their homes, etc.). 6. Dog bites (There are more Pitties now, so dog bites have risen proportionally with the increase in population). Did you know that there is no such breed as a “Pitbull”? Pitbull is a generic term used to describe a powerful dog with a large head and a strong jaw. It encompasses American Staffordshire terriers, American Pit Bull terriers (not pitbull) and Staffordshire Bull terriers, as well as mixes of these dogs. 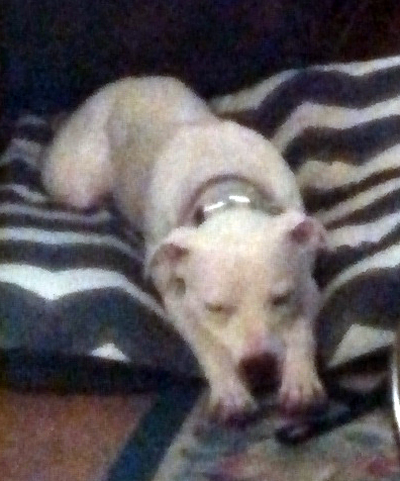 In some areas, “Pitbull” dogs are identified by appearance alone. 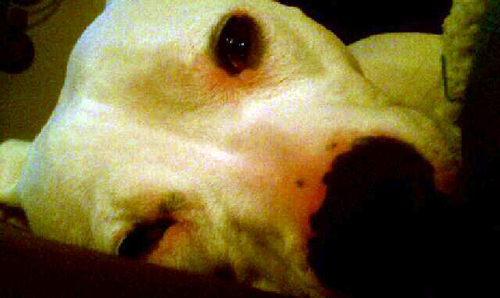 The outlook is grim; however, there are a number of no-kill shelters specifically for these “bully breeds” cropping up. That last part is good news, because owners are giving up their dogs at a high ratio. We need more education for owners and more safe places for the dogs to go. I encourage everyone, everywhere, to practice responsible pet ownership. Research the dog (or cat! or whatever!) that you are considering getting, and think through whether or not it will be a good fit with your family. Factor in children, as well as your housing and/or yard situation. Think honestly about the time you have to spend with your pet. Spay and neuter, and train, train, train, your dog. Today’s article gives me Paws for Thought. I hope you think about it, too. This entry was posted in Uncategorized and tagged animal shelters, article, Chicago Tribune, euthanize, overbreeding, Pitbull, puppy mill on December 6, 2013 by maggie0019.